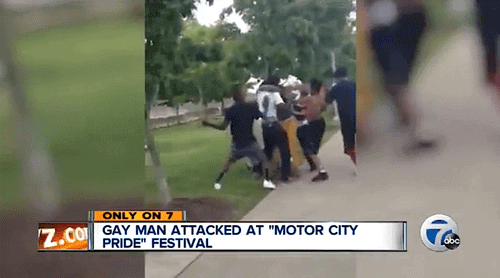 Police have arrested a 16-year-old in connection with the beating of Christin Howard – the 20-year-old Detroit gay man taunted and attacked by a group of males during the Motor City Pride festival earlier this month. Detroit Police Officer Jennifer Moreno said Friday afternoon that the juvenile is in custody and a warrant request has been forwarded to the Wayne County Prosecutor’s Office. Details of the allegations against the juvenile haven’t yet been released. Moreno said several witnesses have come forward to help identify multiple suspects. Tammara Howard called the beating “disgusting” and said her son is recovering well from the attack, which left him with a fractured finger, damage to his left eye and several bruises on his back and face.